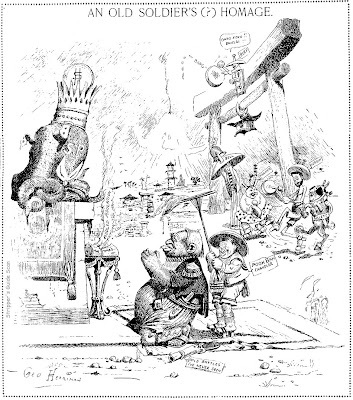 The top cartoon, another swipe at the Southern Pacific Railroad, was printed on 10/1/06, the other two from 10/2. The highlight of this batch, full of Herriman wordplay, is certainly the one about the Tommy Burns - Fireman Jim Flynn world championship fight that would take place later that day. Burns KOed Flynn in the 15th round and retained his heavyweight title. Fun fact - though both fighters have very Irish names, they were both pseudonyms. Burns was French-Canadian, Flynn was Italian-American. that first cartoon has been printed somewhere or other in recent years. Every time I look at the little fellow I can't help but think of Doberman from the old Bilko TV show. Another nice set of cartoons. As to Burns vs Flynn, Burns won by KO in the 15th round. Burns was heavyweight champ. He beat Marvin Hart (hardly anyone remembers either Hart or Burns) on 23-February-1906 and lost it to Jack Johnson on 26-December-1908. 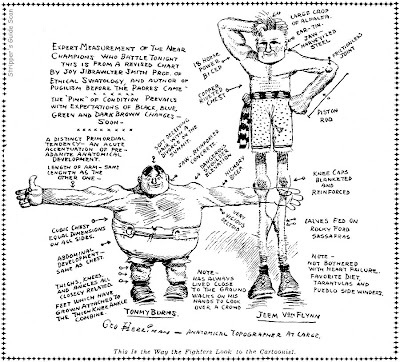 Here's Toyland by lady cartoonist Myrtle Held. This is one of the first daily-style strips ever produced as a special offering for the Christmas season. The closed-end Christmas strip would later become a syndicate staple, with King Features, NEA, AP and others offering one every year. Toyland ran in the Christmas season in 1913 and 1914. In its home paper, the New York Evening World, the running dates were December 3 1913 to January 28 1914 (obviously they had some leftovers that had to run late), and December 5 to 17 1914. The above sample is the first strip in the 1913 series, and has a rather un-Christmasy subject, a woman who didn't wait for her sailor beau to return from sea. This first strip has pretty awkward art, and the gag has nothing to do with the characters being toys, but Held improved quite a bit in her later offerings. Obscurity of the Day: How Would You Like To Be John? 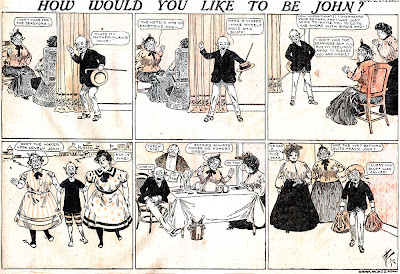 How Would You Like To Be John ran in one of the McClure Syndicate Sunday sections (the one I've always termed 'section A', not that that means anything to anyone but me) from August 23 1903 to April 9 1905. The cartoonist was John A. Lemon, a fellow whose gags and style are serviceable if not particularly exciting. Lemon's claim to fame, if he has one at all, is that crazy signature of his. It took a lot of digging to finally figure out his name, though I'm afraid I don't recall exactly where or from whom the breakthrough came. To make the search even tougher, his weird squiggle looks a bit like George H. Blair's, another cartoonist of the era. Lemon's only known newspaper comic strip work was in these early McClure sections. Yes, Gerald Forton did draw some of the He-Man and the Masters of the Universe comic strips. He worked at Filmation at the time as did most everyone else affiliated with the strip. Luckily for us comic strip readers, toys tend to go in and out of style fast enough that cross-marketing seldom reaches the newspaper comic page. However, the inexplicable phenomenon of the Masters of the Universe craze was one bullet we didn't manage to dodge. 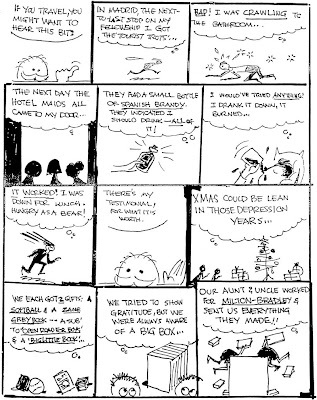 McNaught Syndicate, close to the end of its existence, distributed this daily and Sunday strip for just less than a year. The Sunday ran from July 20 1986 to June 7 1987, the daily dates are unknown but presumably coincide. The Sunday strip was written by James Shull for the first three months, then it was taken over by Chris Weber. Art was supplied by Gerald Forton. Credits were often missing entirely or too murky on the Sundays (they were often lettered in an area of dark purple - brilliant!) , so others may have been involved. For reasons unknown, the strip's colorist, Connie Schurr, who should not have wanted the limelight for this hackwork, received a credit line on the Sundays. Not knowing anything about the back-story of He-Man I don't know how the strip compares to the turd blossom-like marketing of these dolls in animated cartoons and comic books. For more information than you could possibly want to know about the subject jump on over to the Wiki page. Oddly enough, though the toys have a large fan base and many websites are devoted to Masters of the Universe lore, I couldn't Google a single site that seemed to acknowledge the newspaper comic strip series. Hello, Allan----Well, here we are, at the very dregs of comic stripdom, the prefab copyrighted promotion. Not explicitly advertising, although it pretty much is. A few examples come to my mind: BILLIKEN AND BOBBY(1909) promoting the turn-of-the-century bhudda-like character, CHARLIE CHAPLIN'S COMIC CAPERS, apparently regarded as such a big fat advertisement they had artists running from it, THE BOOP-OOP-A-DOOP GIRL, the 1933 attempt to shore up the waning career of singing oddity Helen Kane, I LOVE LUCY, a 1950's short-lived strip version of the hit TV show, and THE SIMPSONS had a strip several years ago, that apparently lasted only a few months--did people just smell "ad", and reject it? I thought it was kind of funny.-----Cole "Skeletor" Johnson. it's written that famous Belgian artist Gérald Forton was the artist for HE-MAN and that Stan Lee worked as a writer. My understanding is that The Simpsons strip continued on after its initial year only in foreign markets. So few US clients kept the strip for the whole first year (canceling it over what they considered tasteless material) they didn't really bother continuing to offer it here. Supposedly still doing well in England and other places. And Fortunato, I cited Forton in the post. I've not seen any strips signed by Stan Lee. Yes, I was asking about Lee, not Forton. I never have read a Smiling Stan interview where he talk about Masters od the Universe. I know only he was a writer for AMAZING SPIDER-MAN, INCREDIBLE HULK, MRS. LYONS' CUBS, MY FRIEND IRMA, VIRTUE OF VERA VALIANT and WILLIE LUMPKIN. Anyone else remember that Pokemon comic strip that ran in American newspapers cira-1999-to-2000? It was actually pretty well drawn but like many toy based strips it didn't last long. Yup, there was even a reprint book "Pokemon Meets The Press". Regarding the art, well, I'm just not a manga fan. I'm sure that strip will bob up here as an official obscurity one of these days. POKEMON was syndicated by Creators (text by Gerald Jones and art by Ashura Benimaru Itoh). I think it run from 1999 to 2001 (or more). The top strip is out of register. Could that be why you're calling it "murky"? Why is there such a backlash towards children of the 80'nostalgia? Are you one of the older elite who doesn't understand why fans of this toy exists? Guess you don't understand cause of the comic book snobbery I see pouring through this blog. Anonymous 1: I wasn't calling the art murky, I was referring to the placement of credits in areas of dark color. Anonymous 2: I am indeed guilty of not understanding the popularity of "He-Man", or for that matter, muscle-bound superhero juvenilia in general. Fine for 12 year olds I guess, but any fan of He-Man today is presumably well in excess of that tender age. indicated by the colorist. I actually paid my own way to fly from LA to the east coast to meet with the publisher and rectify some early problems. Several friends, some actual He-Man fans, have mentioned your harsh and unwarranted comments to me. Do I know you? Just from your work on this strip. Am I a critic or historian? For the purposes of this blog, I play both roles. When history and art coincide, it is a rare historian who doesn't make value judgments. Do I know how newspaper strips are colored? Sure do. I know that you had the option of either indicating palette codes or providing a colored photostat as a guide. From your msg apparently you went with the former, and seem to have chosen colors that were too saturated for the lettering to show properly. In the He-Man strip, of which I'm just a few strips shy of a full run here to look at, this problem occurs almost constantly throughout the run. Such problems are often fixed by the good folks in the mechanical department -- it's not uncommon for colorists to ask for oversaturated colors, not realizing the inherent problems that causes with low-grade newsprint stock. Purely a guess, but I wonder if the mechanical guys decided to give your work a hard time because they saw you getting credit on the strip. As you may know, it is rare in the extreme for newspaper strips to display a coloring credit. The mechanical dept folks put a lot of work into the coloring of strips and I can see them being (unfairly) peeved to find someone getting credit when they never do. People who toil away unacknowledged tend to get a bit fussy when they see someone getting credit for what they see as their work. Maybe they let your color directions stand even when they realized they wouldn't work well, maybe they even sabotaged your work. No way for me to know, but the resulting printed strips were in fact dark and muddy, hence my comment. I'm sorry that my comments were harsh. I will tend to get pretty flip about a strip like He-Man, which would likely have been responsible for killing a good strip in the papers that picked it up. The strip was, at base, just a crass advertisement for a toy, after all, and deprived a serious cartoonist, someone whose livelihood depends on their feature, of markets only to give their spot to a thinly disguised corporate ad. I'd be willing to bet that whatever corporation was responsible for this toy underwrote the strip so that it could practically be given away to papers, making the playing field decidedly not level. I can see no great honor in being involved in that sort of base commercialism, and I'm surprised that after all these years you have an interest in defending the feature. I'm sure you went on to far better things. Popularity, my grammar and spelling impaired friend, is no measure of quality. If it was then we'd all hail Harlequin romances as great literature, Michael Bay's pinheaded spectacles as great cinema, and Britney Spears as a worthy successor to Mozart. Look, if a 30-year gone action-figure craze is the cream in your coffee that's just fine. Luckily we don't all have to like the same things. It's not like I get or expect a lot of respect from 'regular folks' for my enduring fascination with newspaper comic strips, just as I'm quite sure you don't for your particular mania. But is that any reason to rail against those who don't share your interest? Surely you don't think that insulting people is going to magically open their eyes to the wonders of He-Man. Now do me a favor and crawl back in your hole you nasty cretin. Either that or put a modicum of effort into writing a more elegantly worded and reasoned defense. I might just take your barbs more seriously if they weren't written with all the wit, intelligence and style of a third grader. i have MASTERS OF THE UNIVERSE COMIC BOOK HE-MAN 80s 1st and 2nd is it worth anything? "For the first time ever, Dark Horse brings you a collection of these strips, restored and ready for you to unleash the power!" If your taste in comic strips runs to the more literate, introspective and subdued side, the pickings are pretty slim. There's Krazy Kat, of course, and Mutts, and perhaps Pogo. Beyond that you're pretty much out of luck. One feature that takes that genre to a whole different level, in fact that pretty much defines its own genre by going so far beyond those other strips, is Paul Madonna's All Over Coffee. Madonna's strip (well, he calls it a strip but it's almost always a single panel) runs only in the San Francisco Chronicle. 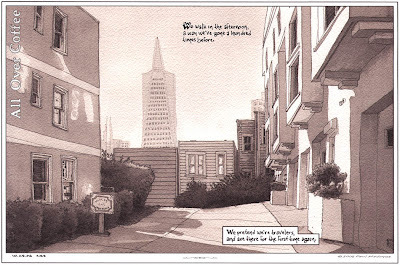 The feature combines beautiful freehand watercolor drawings of San Francisco cityscapes with little snippets of conversation, short narratives and haiku-like declarations. Madonna's texts are often quietly funny, sometimes bittersweet, occasionally forlorn. Some of the most successful are those that read like conversations overheard in a coffee shop (and thus lending some logic to the name of the feature). And while the texts celebrate humanity, our foibles, passions and prejudices, the drawings, at least on the surface, reject humanity completely. 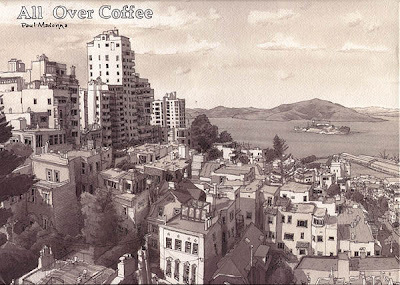 Madonna's dramatic portraits of the city are drawn without human figures -- his San Francisco is populated only with the works of man, not the builders themselves. Madonna in the afterword to this collection explains that a great deal of thought goes into marrying the text and the images. Occasionally the connection is reasonably obvious, many times it is a match of moods that is only manifest to the author. Whatever the connection, the images are hauntingly beautiful. 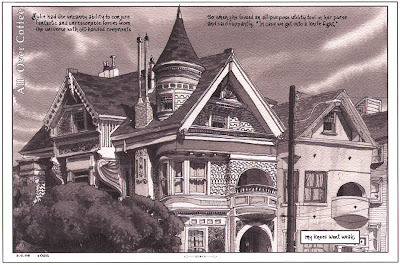 Madonna draws architecture without a straightedge, and the seemingly monochromatic drawings are often warmed with a subdued, almost hidden, use of color, lending the cityscapes a warmth that amply makes up for the lack of humanity. All Over Coffee is, unfortunately, not a candidate for syndication, nor is it a likely model for other features that widen the bounds of the newspaper comic strip. Which is too bad, because it would be interesting to see what sort of public reaction there would be if a few such strips showed up on the nation's funny pages. Is there room next to Cathy and Garfield for such things? Following are a few representative samples from the book. It's just gorgeous. My eyes could walk around in those drawings for hours. Two for one Monday here at the ol' Stripper's Guide blog. Both these panel series, which appeared in the Boston Post, ran on Sundays in their magazine section. 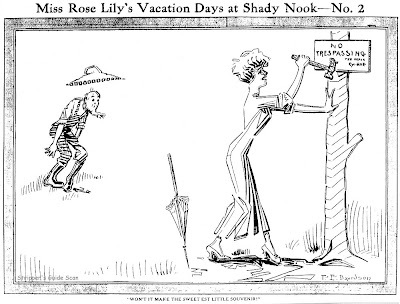 The first, Miss Rose Lily's Vacation Days at Shady Hook, ran from August 3 to October 26 1913. 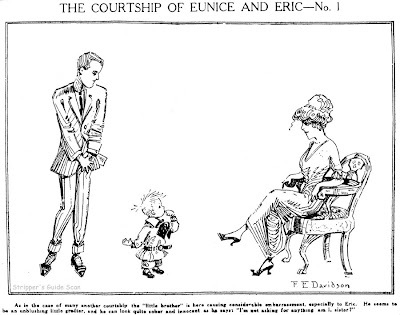 The second, The Courtship of Eunice and Eric, replaced it on November 2 and ran until sometime in 1914 (I'm still indexing this paper). 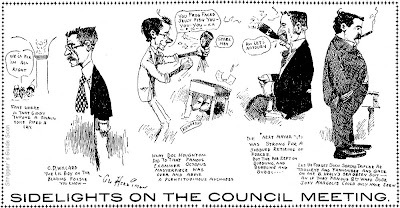 Frank E. Davidson's only cartooning work that I know of ran in the Boston Post exclusively. These two are his first features for that paper, the last appeared in 1921. He had a severely angular and spare style, an odd choice for these panels that often ran at a pretty large size, up to a quarter page sometimes. He seems to have had little interest in drawing backgrounds, and his figures are positively architectural, constructed mostly of straight lines. It's the sort of style that is interesting if not necessarily appealing.